Order in bulk and save! Enjoy a fantastic price on our beautiful handmade beeswax tea light candles. You may find similar candles in the cheap metal tins, but not in the high quality plastic cups we provide! Click on "Quantity Pricing" to see how you can save even more money! 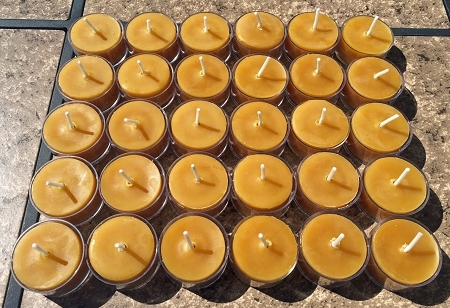 We now offer custom fragrance and essential oil options for our beeswax tea lights. Due to the small batches being produced and the custom nature of the order, we provide a turn around time of 5-10 days for all custom fragrance options. Our Lavender (EO) and Creamy Vanilla are always in stock. Since our tea light cups are reusable, we offer our bulk tea light candles with or without the tea light cups (refills). These are 100% Pure American Beeswax Tea Light candles. 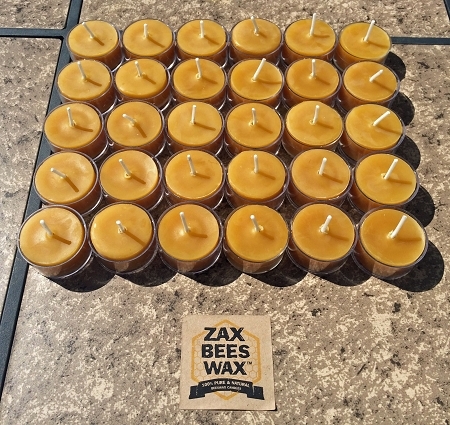 They candles have a wonderful natural scent that comes from the natural honey the beeswax contains. These are the only candles I use anymore! I love that you can get just the refills to save some money and waste! The tealights are awesome. I use them every day in my house to create a warm glow at the breakfast and dinner table. I feel good knowing they are 100% beeswax and the source is from within the US. I purchase them in bulk (150 at a time) and I am never disappointed with product or delivery. The King of Sting is just that King! These candles are perfect for burning in a bird household. I always have to be mindful of my parrot because parrots have sensitive respiratory systems and beeswax is much safer than parrafin. Truly glad I purchased these. I had never tried beeswax candles or knew much about them. I now know that beeswax will be all that I purchase from now on and it will be from here. This is the second time I’ve ordered and I haven’t been disappointed yet! Consistently good quality tea lights. Keep up the good work! Q: Hi! Can the tealights in the plastic cups be burnt right on a counter or do they need a glass tealight holder? Thank-you! A: Yes, they can be burned in just the tea light cups. However, they will be more consistently and safely in a holder designed to hold tea light cups.